We are at RightsCon 2017 in Brussels this week with many of our friends and colleagues globally to discuss how to keep the Internet open, free, and secure. From Wednesday to Friday there are 1,200+ attendees from 95 countries with 500+ organizations, tech companies, universities, startups, and governments attending. There has never been a more important time for all of us to meet to tackle the issues at stake. Check out the entire list of speakers and sessions here and for a look into the wide variety of topics on which we are speaking please find the details below. The Opening Ceremonies featuring Mozilla’s Executive Chairwoman, Mitchell Baker, will be livestreamed here along with other sessions in the Palace Ballroom. Also, keep an eye on the main Mozilla blog on Wednesday for us to reveal who won the Equal Rating Innovation Challenge to spur innovation in bringing the next wave of people online. 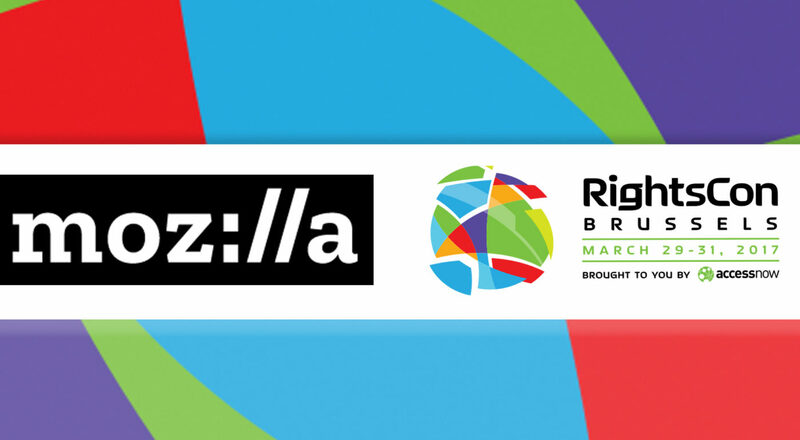 If you still can’t get enough RightsCon coverage, some of our global Mozilla community members will be reporting live on our Mozillagram Instagram channel and you can take part and keep up to date on all the conversations around the event using #RightsCon. Towards a Priva-TISA-tion of Human Rights? Is The Internet Unhealthy? How Do You Measure It?